Sleek geometry meets divine elegance. Our Reverie print features a beautiful flower mandala inspired by Bali's magnificent flora. This print has subtle radiance, perfect those who aren't afraid to manifest their dreams. ﻿Our high-waisted leggings are back and better than ever. Figure-flattering, supportive and breathable, these leggings can go from yoga right to brunch with the girls. With a zip pocket on the back of the waistband, there is no need to worry about where to put your keys or credit card while you're out and about. These leggings are beautiful, soft, breathable, and versatile! The fit is absolutely perfect around the waist (rare for me) and I can see them flattering girls of many sizes, shapes, and heights. The pattern is stunning and so far doesn't seem to show signs that they will fade at all. I wear them for yoga, aerial silks, or hiking, or just lounging around the house, they are soooooo comfortable! Its amazing that they are made from recycled material and are so good to mother earth as well! 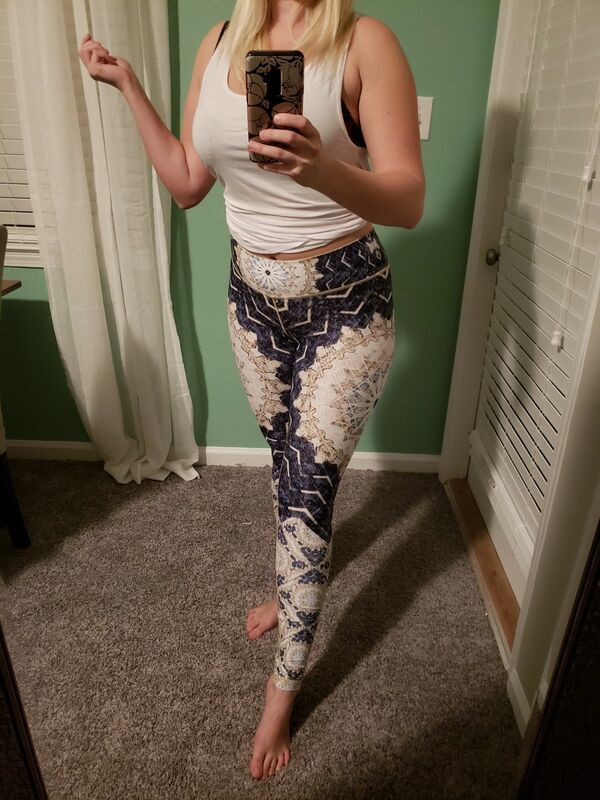 One of my favorite pairs of leggings!! They are so comfortable and the design is amazing! I’m so so happy with my purchase! I will definitely be buying products from here again! Although I had to wait several weeks i love the look, feel and fit of my reverie legging. These leggings are SO comfy! They look amazing. The fabric is so soft. The quality is fantastic. They are very flattering! Can't say enough great things about them. I want to get the whole collection now! Do you have a long torso? What do you wear your leggings for? This is my third pair of leggings from here over the course of two years and they keep getting better! I love the addition of the little pocket in the back, and they are always the most comfortable leggings. The style of these is beautiful in person and I wear them all the time. How do you feel in your clothes? How comfortable is our fabric? How does your purchase fit? How many compliments have you gotten?